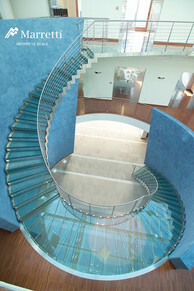 Stairpro - Custom-made Staircases, Imported Staircases, Italian Stairs. 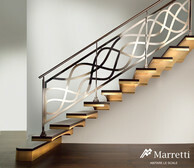 Marretti® is a leading Italian staircase designer of contemporary staircases, spirals, and balisters of which Stairpro® is proud to be the sole agents for the supply and installation in Australia and New Zealand. Marretti® was founded in 1970 in Italy, that is, in Tuscany, Florence, the cradle of art and beauty. The first step of every Marretti® staircase rests on awareness: the future springs from history, innovation from experience, and the fact of turning towards the world out of love of one's own country. This is where every step takes shape, first in the design form and then in the selection of the raw materials, their painstaking processing - with every single component made in-factory - an finally, the tailor-made creation of every staircase. Made in Italy only. No one staircase is ever the same as others, and when they are finally ready for being lived on, each and every staircase is the perfect ambassador for Marretti's passion for authenticity, quality, and anesthetics.